Hot off the back of a critically acclaimed run at the Donmar Warehouse, Josie Rourke’s revival production of The Weir transfers to the Wyndham’s Theatre from January 2014 for a limited 12 week season. Having first premiered in London in 1997, Conor McPherson’s text won multiple awards, including the Laurence Olivier Award for Best New Play and the revival production looks set for a similar success. 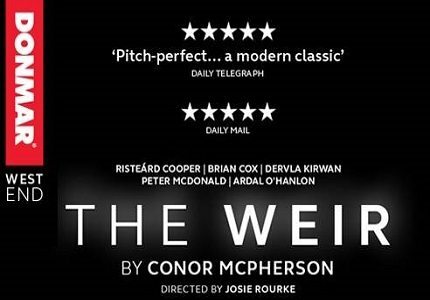 The Weir is a “modern ghost story” set in an isolated pub on the West Coast of Ireland. The story beings as Landlord, Brendan, Garage owner Jack and his employee Jim are having a chat about the beautiful young woman, Valerie, who has just moved to the area. As Valerie arrives at the pub with a local business man, Finbar, the gentlemen start reminiscing about their upbringing to impress the young lady. The stories take a supernatural twist and Irish folklore, mysterious goings on and ghosts are discussed. Once the men have regaled their tales, Valerie tells a haunting tale of her own, unveiling the true reasons she left her former home in Dublin. Whilst there are some comedy elements, The Weir is undoubtedly a moving tale of, loss, melancholy and missed opportunities. The Weir stars Risteárd Coope, Brian Cox, Dervla Kirwan, Peter McDonald and Ardal O’Hanlon. The Weir is a modern ghost story and may be slightly frightening to children that can understand what is being said. The subject matter is quite dense and may go over some small children's heads, however this really is a play best enjoyed by teenagers and adults who will find the show far more engaging.